Show of hands for anyone who wants to spend a beautiful, sunny Sunday afternoon in a dark theatre watching some musty Shakespeare? In all honesty, I was kicking myself for accepting the invite to this show. Going into a sunny theatre when I knew my friends were out on a beach firing up the grill made my heart hurt a little bit. And when the audience was just me and six other people, I began to feel even more sorry for the cast, who got a double-whammy of performing on a beautiful day for an audience of seven. However, the show started, and I quickly forgot about all of that. Powerful acting, smart direction, and a story steeped in rage and greed all came together to make it an afternoon of compelling theatre well worth the sacrifice. The Rise and Fall of the Mad King of Scotland is a streamlined version of William Shakespeare’s Macbeth produced by Nothing Special Productions — a newish Elgin-based group. Mikey Laird, who adapted and directed the piece, has reworked the nearly three-hour show into a taut, one hour, 45 minute afternoon told by six actors and minimal props in a black-box setting. It’s briskly-paced. It holds your interest (which, to be honest, is a challenge for me whenever Shakespeare’s involved). The actors intensely stare in your eye as they confidently navigate the bard’s dense wordplay. It’s nearly impossible not to be engaged. Brian Rohde plays “mad king” Macbeth with fearlessness and maniacal greed as he claws his way to power through deception and murder. As his wife, the one who sets the gears turning in Macbeth’s head, Celeste Burns is stunning. Lady Macbeth is a deceptively tricky character. She could easily be seen as a heartless manipulator, set to claim her throne next to her husband, but we come to learn she has a strong conscious that ultimately is her undoing. And Burns radiates all these complex facets through her artfully phrased performance. The dashing Matt Drake also makes a strong impact as doomed King Duncan, and later Macduff, who suspects Macbeth of regicide. Conor Burke, Daniel Vuillaume and Melanie Kibbler round out this skilled cast. Fight choreography by Stephen Wisegarver provides for a gripping final standoff between Macduff and Macbeth. Support good theatre and new talent. Go see it. 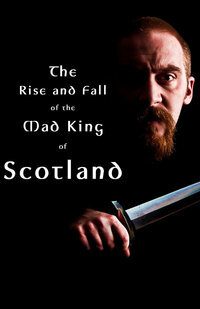 “The Rise and Fall of the Mad King of Scotland” plays through June 13 at The Artistic Home, located at 3914 N Clark St., playing Fridays and Saturdays at 8pm and Sundays at 7pm. Tickets are $15 for general and $10 for students/seniors/industry tickets. We saw this remarkable produciton–an accesible distillation of the Macbeth story, performed by a highly talented cast and we were blown away by the creativity, passion and inventiveness of all concerned. Great performances by all. Rohde’s Macbeth and Burke’s Banqo are not to be missed. This is an ensemble to keep an eye on.